Smithtown Town Hall is located at 99 West Main Street, Smithtown NY 11787; phone: 631-360-7620. Photo: Caleb Smith House, ca. 1751, Caleb Smith State Park Preserve, Smithtown, NY. 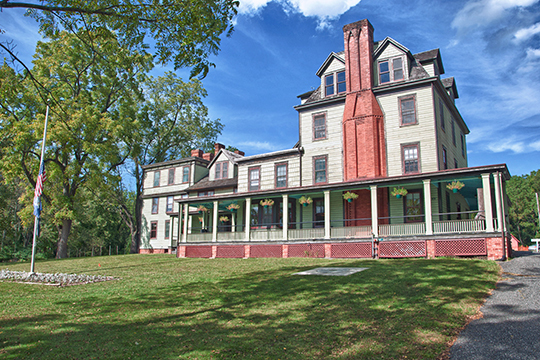 Listed on the National Register of Historic Places in 1990 as part of the Wyandanch Club Historic District. Photographed by user:AJW1188 (own work), 2012, [cc-by-3.0 (creativecommons.org/licenses/by/3.0)], via Wikimedia Commons, accessed December, 2015. Smithtown was first organized around 1677 and officially recognized as a town in 1788. Colonists first settled Smithtown in the late 1650s. A few families that were evicted from Northport settled where Sunken Meadow Road and Bread and Cheese Hollow Road are today. In 1658, Grand Sachem Wyandanch deeded most of the land that is now the Town of Smithtown to an Englishman, Lion Gardiner, in repayment for Gardiner finding and returning the chief's kidnapped daughter. Gardiner transferred the land to Richard Smith in 1663. A settlement grew around his house, which was located near Moriches Road and Long Beach Road in what eventually became the Village of Nissequogue. By the early 1700s a few dozen houses were scattered throughout the Town. Until the late 1800s the Town was predominantly an agricultural area, and did not have any dense villages like Huntington, Patchogue or Northport. Small settlements grew at crossroads such as Jericho Turnpike and Commack Road, and Middle Country Road and North Country Road. The only industries consisted of a brickyard in Fort Salonga, a few gristmills along the Nissequogue River, and a couple of cordwood shipping operations. The extension of the Long Island Rail Road through the town in 1873 started a profound change in the development of Smithtown. The growth of residence and commerce shifted to the areas around the three railroad stations in the town. A slow growth of homes for commuters and summer residents began. The founding of the philanthropic community St. Johnland in 1865 and the Kings Park State Hospital in 1885 accelerated the growth of year-round residence. Long Island's rapid suburban growth started around 1946, and reached Smithtown circa 1955, when the Northern State and Sagtikos Parkways reached Commack. These limited access highways made the town accessible to employment centers in New York City and Nassau County. Ironically, the Long Island Expressway, which had a profound impact on the development of the Island, did not reach the Town until 1965 (when a majority of the Town was already developed). Planning and Community Development, Town of Smithtown Comprehensive Plan Update, Vol III Draft, Natural and Cultural Resources Study, 2007, www.smithtowninfo.com, accessed February 2010.